Do you need an example Startup Business Meeting Minutes? Download this professional Startup Business Minutes template now! The purpose of the Startup Business Plan is to provide an opportunity to develop and present a proposal to form a business. 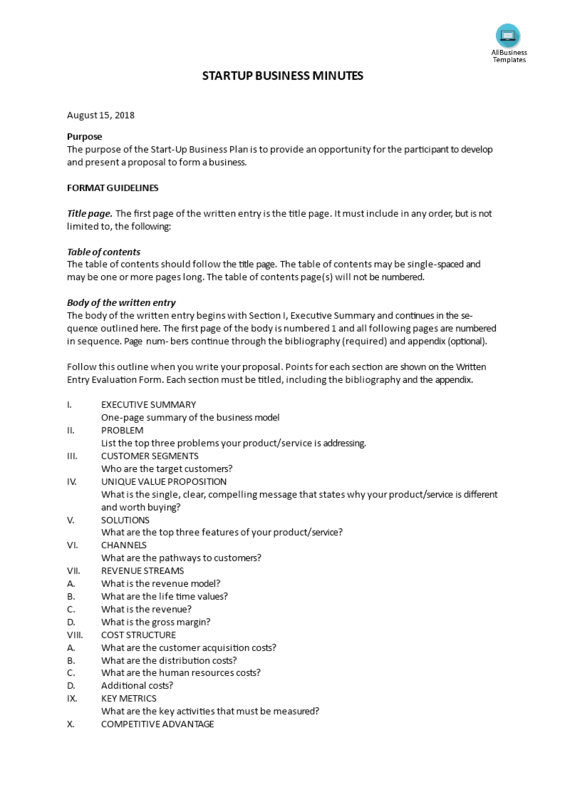 This ready-made example Startup Business Minutes template is well suited for any kind of personalized business matter. Communicating in a professional way will get you and your company respect and will bring you further in life and business. Using our ready to use and easy to modify Startup Business Minutes brings you an extra motivation and inspiration and gives you more time to focus on important subjects in your personalized file. CHECKLIST STANDARDS In addition to following the outline provided, when preparing your written entry you must observe all of the following rules. A one-page summary of the business model. We support you by providing this Startup Business Minutes template, which will save you time, cost and efforts and help you to reach the next level of success in your career and business! Download this Startup Business Minutes template now to kickstart your startup!